2012 Update: Peach has been demoted to a Frozen Dairy Dessert. 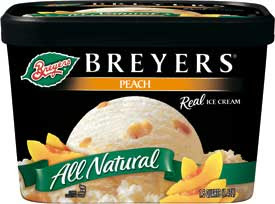 Ok, I'm about to muddle through a review, hopefully it will be apparent that I like the ice cream: So in the freezer is a container of Breyers Peach Ice Cream. I do enjoy peaches, but I can't say I really ever have the urge to eat Peach ice cream. I just don't put the two together, but I knew I should try it. I had a small serving the day we brought it home and I was pleasantly surprised. Not too strong and not too weak, basically the classic Breyers touch to fruit based ice creams (well, except their take on Black Raspberry). I finished the peach ice cream with nothing but positive thoughts. So, I decided to second scoop about an hour ago, and I realized something (and this is where it might get confusing). The ice cream is triggering two responses in my brain. The first is the peach flavor, it's just where I want it to be. It reminds me of a nice chilled Dole Peach fruit cup. Ok, I'm lazy, I don't cut up fresh peaches, instead I use to keep a stash of the peach cups in the bottom of the fridge, ready for duty at a moments notice. The other thing that's getting me is the ice cream itself. It's triggering that comforting feeling you get with a nice fresh container of Breyers vanilla. It's not that it tastes like vanilla, it's just making me think of the vanilla in a good way. It's exactly what I would imagine if I blended some fresh Vanilla ice cream with my favorite peach cups. Hope that makes sense, the point is that I like the peach. It makes me realize how substandard something like Edy's Apple Pie is. The quality is fantastic on the Breyers, even after a week of going in and out of the freezer. On the other hand, the Edy's (Dreyer's) turned into a lovely rubber bouncy ball. I won't be buying peach every week, I'm just not that big of a peach fan, but if you like peach, you have to check it out. I found your blog actually a week ago when I was eating Triple Chocolate ice cream (out of the Breyer's carton) and google'd the flavor and brand. I like Breyer's Peach too. It's light, more refreshing than the other flavors because its really simple. Many flavors will not be converting to Frozen Dairy Dessert..." [and they include 12 varieties]. I don't care what they say, I won't be buying their FDDs again. Oh well, it's just ice cream,... or maybe not.